Going to MWLUG 2014? You need to buy these guys a beer as well…. He’s the guy you really need to thank for this event – without his dedication and enthusiasm, the most significant User Group meeting in North American this year would surely not happen. Yeah I know I have rattled on about this before but it holds as true today as it does any other day before. 1) really? You need a list?? Shame on you…. 3) Dave pays for this amazing service out of his personal pocket. By my reckoning $40 a month for 3+ years is well over $1000 dollars. A $5 beer is the LEAST you can do to repay him. 4) Dave refuses to take contributions – if it would make a difference I would do a kickstarter, but he’d refuse. 5) NotesIn9 is the largest repository of videos and tutorials, created by the largest number of different contributors in the IBM ICS community. If he refuses to let you buy one, buy it anyway and put it in front of him. He’s going to be there for four nights so just do it. Buy the man a beer – you owe him and it would be rude not to!!! The line starts behind me……..join it ! 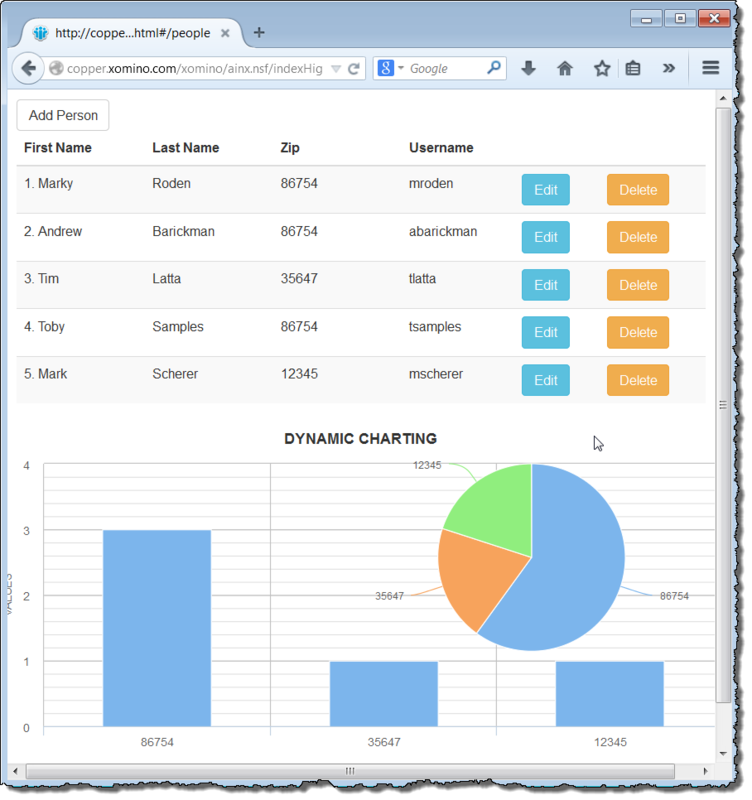 Although not directly related to the purpose of the presentation I am going to demonstrate how to use an Angular.js chart directive to bind to the application service data and create dynamic charting within the application. The following jQuery code makes it work. The getHelp function shows/hides the help based on the boolean in the function. What I found though was that when I used Select2 the field attribute was not being picked up. This is because Select2 creates it own DOM elements to display the field and the original field attributes are not transferred to this new DOM structure. So I needed to come up with a way of accessing the original element from the select2. This turned out to be very simple – select2 emits an event on focus and blur called select2-focus and select2-blur. The event target gives me direct access to the original field the select2 is representing. Using this simple modification to the delegation code I was able to access the help_fieldName to pass to the help Function. 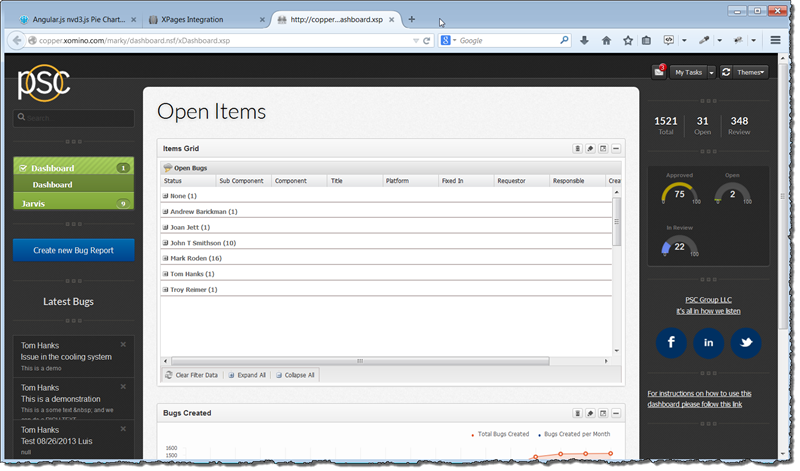 The image below shows the console.log, highlighting the underlying DOM element. Within my demo application I wanted to know when the table was finished loading. The problem is in Angular that there is no “I am finished with the template load” event. The reason is due to the asynchronous nature of the Angular code. I wanted to load the table and then take an action on it. To do this I added a directive to the “repeat control” within my template for loading people. The following example was completely plagiarized from this article – respect ! Well that is a little simple…. Yes it is but it serves to demonstrate the concept. The best part is that there are lots of people who are writing plug and play Directives for Angular – just like jQuery plugins. If I could be bothered I might even do some blog posts on useful Directives…..But is a good resource for looking at some available directives. There are multiple directives for using jQuery plugins within an angular construct – this is very helpful for data binding. There are also multiple directives which are independent of jQuery and are stand along “Angular” plugins for want of a better term. Just wanted to show a work in progress – screenshots of what I am working on for MWLUG2014. Part of the presentation is showing how to make your Angular applications portable. 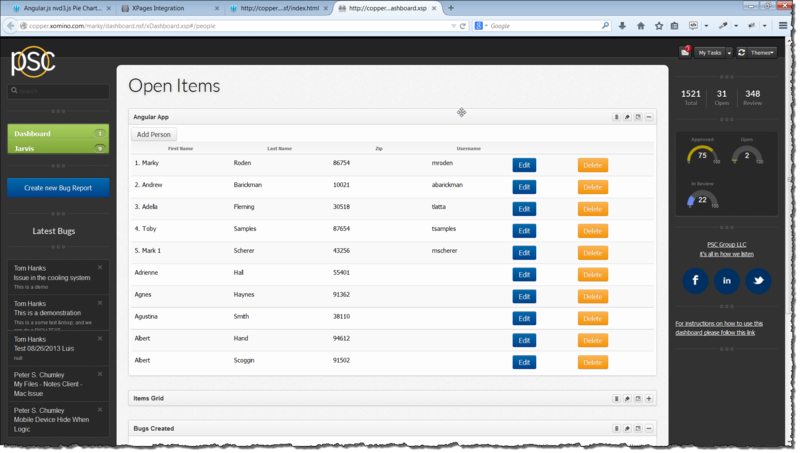 My sample app will be the one I created as part of the Angular in XPages series. With only 4 lines of HTML and zero XPages dependency. Make sure you plan to stick around to the end – I am not on until 3pm on Friday !!! Within Angular there are these programmatic entities called services – and if you read around Angular programming practices (Follow @ToddMotto – http://toddmotto.com/opinionated-angular-js-styleguide-for-teams/) you will find (as I have) that adding application logic within Controllers is generally frowned upon. From a maintainability perspective, as well as logical code layout perspective, having functional logic within the controller is akin to writing a 1000 line LotusScript agent – not optimal !! Now I know you are looking at this and saying to yourself – hang on you just copied and pasted all the code and actually made it longer and more complicated – and that would be very perceptive of you – but (and I had to make this leap to believe it myself), it is better. My example application only really has one purpose – manage people. In a more complex application a separation of logic into like components would make sense. By using the service I have separated all my “do stuff with people” out into a people Service. When I built the next part of the application – to do with buildings for example I would create a buildings Service and manage all my building logic there. Let the controller do it’s job and bind the data to the View and keep your logic out of the controller and into Services.